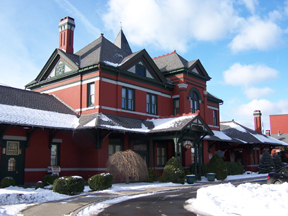 The Law Office of Randall V. Coffill is located in the Historic Erie Depot Building in Downtown Port Jervis, at the corner of the Tri-State Region of New York, New Jersey and Pennsylvania. Randall and his dedicated, efficient staff emphasize the importance of personal and individualized attention to every client. Personal contact and accessibility are the hallmark of service together with an emphasis on results. Randall and his staff endeavor to respond quickly to client inquiries and to provide solutions in a prompt, professional and efficient manner. Clients are referenced by name, not a client number or address. Randall’s diverse background and years of experience provides quality representation in a number of practice areas. We invite you to refer to this web site for more information, and you can contact us through the links provided to arrange for a consultation. © 2018 This web site constitutes ATTORNEY ADVERTISING and has been prepared for informational purposes. It should not be construed as legal advice. The information contained is not intended to create a lawyer-client relationship, and the reader should not act upon the information without seeking professional counsel and advice. Prior results do not guarantee a similar outcome. Web site supported by Computing Solutions.